Cast Size: Medium (12-20) Flexible casting. 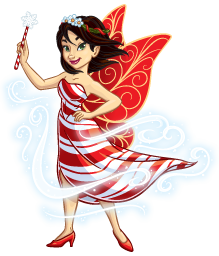 A spunky, playful fairy that is prone to flights of fancy and imagination. She is caring, sometimes a bit clumsy, and loves creating new worlds from a child’s imagination. A spirited and imaginative child. Her favorite time of year is Christmas. Like most children, she loves to play but avoids her weekly chores whenever possible, knowing that she still must complete them to be on Santa’s “Nice List.” Her biggest wish is to meet Santa someday. In his early years he was kind. In the present, he is a crabby, cranky, covetous miserly man. Once he is visited by Jacob Marley and a variety of ghosts, he realizes that he has a new chance to make amends and change his ways. Scrooge’s nephew. He is positive, kind, has a sense of humor, and loves Christmas. He is tolerant of his Uncle and his miserly ways, never giving up on the hope of his uncle enjoying the holidays with his family. A ghost bound by the chains he forged in life, Jacob’s intent is to scare Scrooge into changing his ways. He enjoys his ghostly antics even as he is resigned to his fate. Scrooges Clerk. A kind, if a bit timid devoted father. A mischevious boy, dressed as his favorite super hero and always seen with his latest comic book. A super hero, has many superpowers, but he holds the power of the sun in his hands. Looks suspiciously like Mindy’s Dad. Male: 20-30 years old. Range A2-F4. The villian of Hero World. With his heart of ice, he places his victims under his spell. Still very much the 8 year old in a grown up body. Doesn’t quite get all the talk about grownup subjects like marriage. Her personality sparkles like a jewel! She is quick, clever, and loves beautiful clothes. Bubbly and a bit obsessed with handsome men. Genuine, humble, looking for the right prince, not the perfect one. Stately, refined, and a bit other worldly in her attitude. From the kingdom of Starry Skies…. Snowflakes, Townspeople of Christmas Town and the North Pole, Mindy’s Mother and Father, Carolers, Ghost of Christmas Past Present and Future (strong vocalists with excellent pitch and harmony skills), Christmas Town Soloists and Dancers, main characters double as ensemble in various globes.